Macular Degeneration is damage or breakdown of the macula of the eye. The macula is a small area in the back of the eye that allows us to see fine details clearly. When the macula doesn’t function correctly, we experience blurriness or darkness in the center of our vision. Macular Degeneration affects both distance and close vision, and can make some activities – like threading a needle or reading – impossible. Although Macular Degeneration reduces vision in the central part of the retina, it does not affect the eye’s side, or peripheral, vision. For example, you could see the outline of a clock but not be able to tell what time it is. Macular Degeneration alone does not result in total blindness. People continue to have some useful vision and are able to take care of themselves. Many older people develop Macular Degeneration as part of the body’s natural aging process. 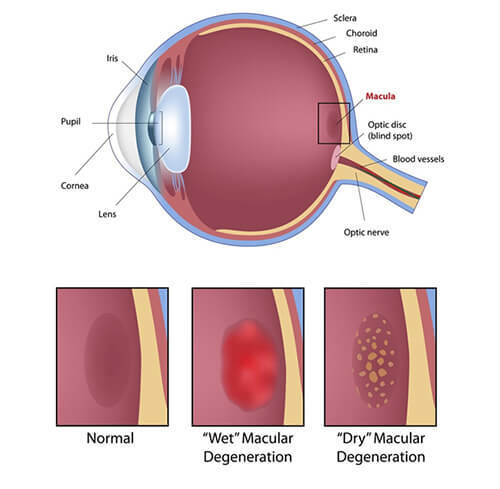 The two most common types of age-related Macular Degeneration are ”Dry” (atrophic ) and ”Wet” (exudative). Most people have Dry Macular Degeneration. It is caused by aging and thinning of the tissues of the macula. Vision loss is usually gradual. Wet Macular Degeneration accounts for about 10% of all cases. It results when abnormal blood vessels form at the back of the eye. These new blood vessels leak fluid or blood and blur central vision. Vision loss may be rapid and severe. Despite ongoing medical research, there is no cure yet for Dry Macular Degeneration. Some doctors believe that nutritional supplements may slow Macular Degeneration, although this has not yet been proven. Treatment of this condition focuses on helping a person find ways to cope with visual impairment. The newest therapy for Wet Macular Degeneration is centered around medical treatment with injectable medications such as Lucentis, Avastin and Eylea. Photodynamic therapy plays a role in treatment as well. With new clinical trials that are presently underway at Magruder Eye Institute, there will be new medicines released to further expand our treatment of both Wet as well as Dry Macular Degeneration. Because side vision is usually not affected, a person’s remaining sight can be very useful. Often, people can continue with many of their favorite activities by using low-vision optical devices such as magnifying devices, closed-circuit television, large-print reading materials, and talking or computerized devices. If you are experiencing any of the conditions mentioned above, contact Magruder Eye Institute and schedule an appointment one of our Retina Specialists.